This Memorial Day Weekend is sure to bring a large influx of beachgoers looking to celebrate the holiday! We at EarthWay Real Estate, take pride in our area and want to remind you to have fun, but be aware of nature’s beautiful bounty. Here are some helpful hints that you can do to help us protect and be good stewards of our lovely beaches for generations to come. 1. Keep the plastic and Styrofoam away! The City of Folly has already incorporated new ordinances in an effort to limit the amount of plastic and Styrofoam left on the beach by limiting the use of plastic bags and Styrofoam within the city limits which began January 1, 2017. The ordinance effects grocery stores, gas stations, restaurants, and retailers up to and including the Harris Teeter on Folly road. These businesses are banned from distributing plastic carry bags of any kind, Styrofoam cups, coolers, take out containers or balloons. Beach goers are also not permitted to bring these Items to the beach with them. Instead bring your snacks and drinks in reusable, non-glass, containers! 2. Use reusable water bottles! Folly Beach has set up water bottle fill station, located all around the beach, to cut back on the number of plastic bottles used. The group Go Folly Green started this initiative. These stations are located at the Folly Ocean Park, the Wave Watch Playground, Folly Beach Community Garden, and the covered Washout at 150 East Ashley. Bring a trash bag with you so you can keep up with throwing your trash away and take that trash with you when you leave. Make sure to weigh down any trash/food that may be taken by the wind and If you see trash pick it up. If you’re going to smoke, bring a container with you to stash your cigarette butts in. If you forget a trash bag, trash bins can be found at every beach access! 4. 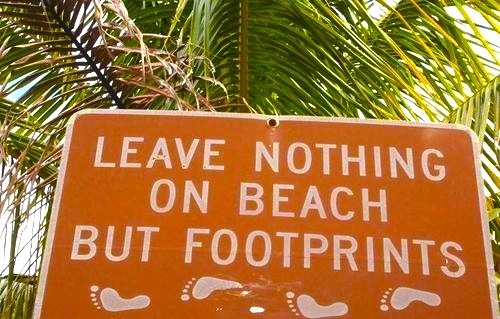 Leave the beach with all your stuff! A lot of stuff can get left on the beach by accident. An easy way to make sure you leave with everything is to keep everything you brought with you nearby and organized. Once done playing with games or sand toys put them away, you can always get them back out! We hope everyone has a great holiday weekend but we also hope everyone is doing their part to keep the beach clean, safe, and beautiful! EarthWay Real Estate is conveniently located in the sunny seaside community of Folly Beach specializing in real estate in Folly Beach, James Island, West Ashley, Summerville, Johns Island, and all of the greater Charleston SC area. EarthWay Real Estate is dedicated to a strong community focus, global stewardship, and real estate for YOUR changing world. We aim not only to provide the best real estate services available anywhere but to be a valuable part of our community and continue to give back!